Where can I find UN information on the “Cylinder of Cyrus” a.k.a "Edict of Cyrus" - Ask DAG! Where can I find UN information on the “Cylinder of Cyrus” a.k.a "Edict of Cyrus"
The “Cylinder of Cyrus” also known as “Edict of Cyrus" is considered one of the earliest expressions of the concept of human rights. A replica of the ancient clay cylinder was presented to UN Secretary-General U Thant by the government of Iran in 1971. The original is held by the British Museum. 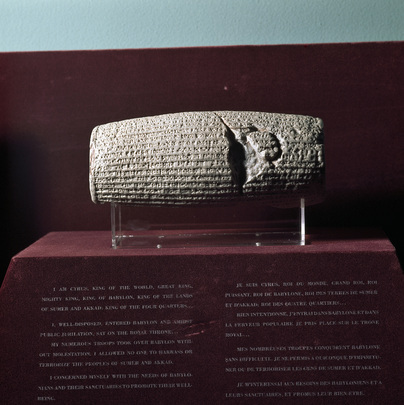 The text contains a declaration made by Cyrus the Great concerning the preservation of human rights in occupied cities after his capture of Babylon in 539 B.C. More information on the presentation and acceptance of the replica is available in the UN Press Releases and communications scanned by the UN Archives (available in one document). Search for images from UN Photo of "Edict of Cyrus"